Polish police said Wednesday they had recovered a painting by French Impressionist master Claude Monet stolen over nine years ago and had arrested the suspected thief. Police spokesman Andrzej Borowiak told AFP that the man, whom he identified only as Robert Z., 41, had been arrested Tuesday in Olkusz, southern Poland. "We're convinced that this is the individual who stole the painting," Borowiak said. He declined to say where the artwork itself -- Monet's 1882 oil painting "Plage de Pourville" -- had been found. "It had been kept in a good condition. It hasn't suffered any visible damage," he said. 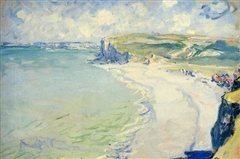 The study of a beach in northern France was the only Monet on public display in Poland and was exhibited in a state museum in the western city of Poznan. The theft was discovered on September 19, 2000. Investigators had long been trying to trace an individual who was seen making sketches of paintings in the museum two days earlier, Borowiak explained. "In December we obtained new evidence that helped us identify that individual, as well as the place where the painting was," he said. Police believe that Robert Z. was the mysterious artist, he added. The thief had cut the painting from its frame and replaced it with a copy. Shortly before the theft, insurers had valued it at million dollars (690,000 euros).